This album "Double Helix Rainbow" is the 100th album from Avant-attaque, yes, it became the a memorable 100th release at 2,276th days since the start of Avant-attaque Download on March 1st 2006. Calculated simply, this means that more often than monthly magazine publishing, JINMO has continued to release his album constantly almost every 3 weeks in these 6 years and 2 months. JINMO and all the staff of Avant-attaque, we all appreciate to all JINMO manias who support his vigorously passionate activities. "Passing through the chaos of the Oort cloud, we reach the cloudless infinite space, the womb of monolith which the cosmic double helix rainbow shines. JINMO's 119th solo album, it is crowning the title "Double Helix Rainbow". On Twitter (Twilog), JINMO often uses the word "double helix rainbow." "Double helix" is common element to the double-helix structure of DNA as you know, and it has used in the design for the logo of "DNA Music Lab" which is the predecessor of Avant-attaque in the latter half of 1980s. "Certainly alive but at the same time we are certainly heading for death, we are on the double helix of Eros and Thanatos." As you can see in the words, it seems that the important concept for JINMO "no border between life and death." is embodied in double helix as primordial design for life. This album "Double Helix Rainbow" is the fantasic, beautiful sound universe but dope in a sense. Double helix rainbow shines in the universe. Binaural beats accelerate the velocity and rise gradually, going intertwined beautifully like DNA. Pulsations beat faster in synchrony. Complex, dense, many layered drone orchestration. What an ascending feeling with Jubilus. When I bask in this sound, I feel like I was an astronaut who has been tempt to far away of the universe, to the home of Gods. Cover picture is the beautiful "Double Helix Rainbow" appeared on July 15 2009, it has taken by Utsuro Takigawa. It is not composite picture. 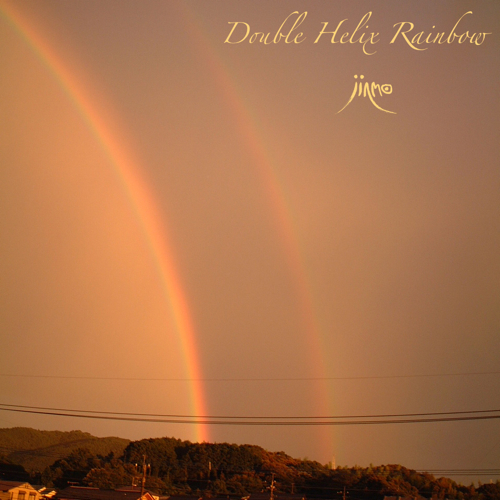 Enjoy "Double Helix Rainbow", it would be the must listen album for all JINMO manias. Trip away to the Jubilus over the beautiful but radical double helix rainbow!